Another thing I decided to change was not putting interfacing on everything. 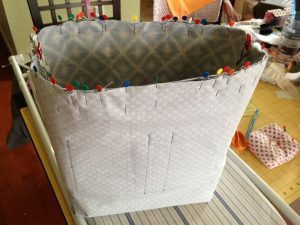 This time, I put the Craft Fuse on the two bottom pieces, along with the outer piece of fabric where the bottom pieces don’t cover, essentially making the interfacing only 1 ply thick on the bag. I didn’t add interfacing to the handles on this second tote, I wanted a softer floppy handle verses one that stood up straight. 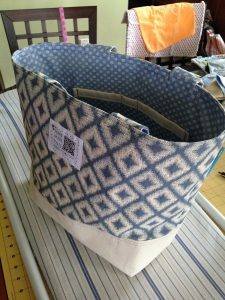 I think moving forward, I may do interfacing on just one piece of the fabric so it’s one layer instead of two in the original market tote tutorial. I’ll have to test it out and see what I like more. I did also cut my handles to a width of 2.5″ instead of the original 2″. I find that with 2 layers of interfacing in the handle made it really hard to turn inside out. It literally took me a half hour or more to flip it. So this time I made the handles just a tad wider but without interfacing, it was much easier to turn with the wider width. My straps were cut to 27″x2.5″ long. With the wider handles, I did fold over the middle of the handle length wise and sewed about 5″ to create a narrower handle, I like it! 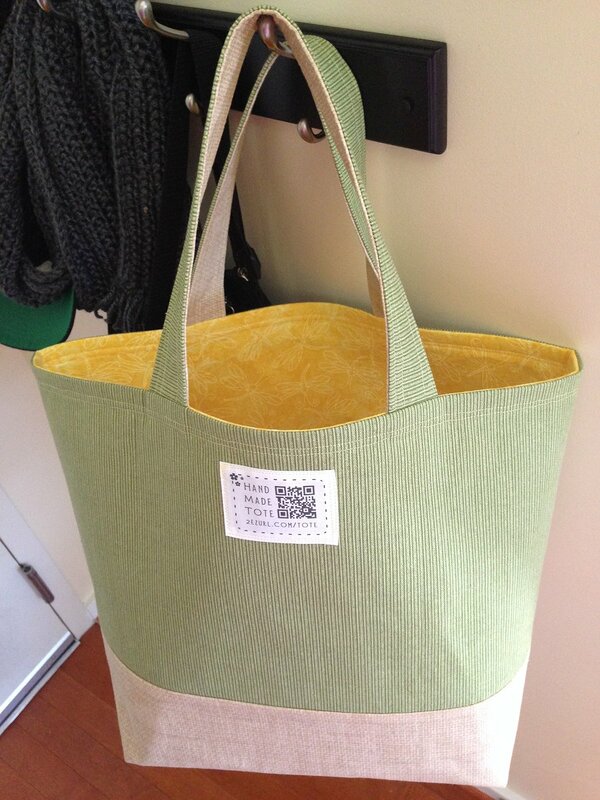 Another tote adjustment I made was to shrink the bag down a tiny bit. This was more so a decision to make a smaller bag. 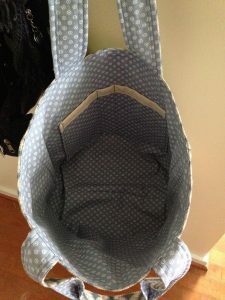 Original size of the fabric was 21″x19″, I cut my fabric to 20″x18″ so it wasn’t that much smaller but it was a better size for carrying and for using the craft fuse since that width is 20″. One last thing I changed was to leave the opening for turning at the top between one of the handles instead of leaving the opening in the bottom of the lining which later would have to be hand sewn shut. I’m still not that skilled at hand stitching so leaving the opening at the top, I was able to sew it closed with matching thread very close to the edge. I like it, much easier and looks better. Handles are floppy on this tote since there’s no interfacing inside. I added pockets to this tote. I didn’t put interfacing on the lining so it’s soft. 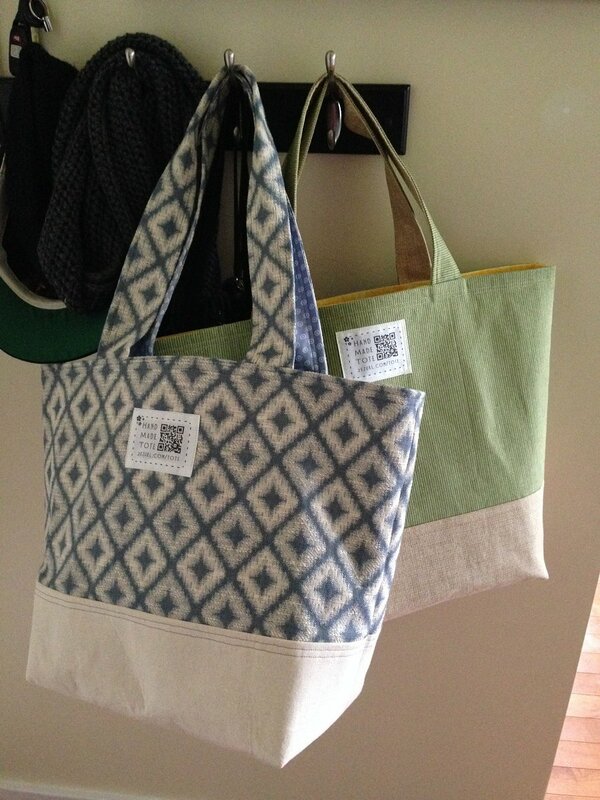 Tote #1 and Tote #2, the front one is slightly smaller. Ever since getting my new sewing machine back in December, a tote bag is something I wanted to learn to sew. 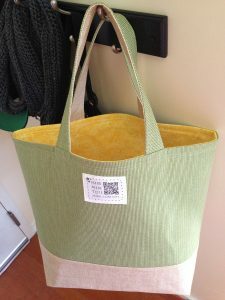 I use reusable totes all the time when I go grocery shopping. 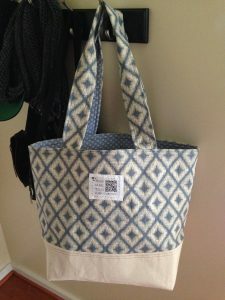 Some of the totes I’ve had are at least a few years old and I noticed that the seams are starting to tear and stitching coming undone. 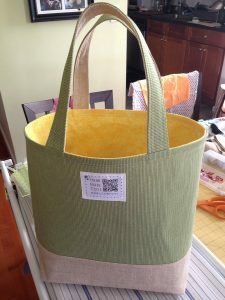 After reading through a lot of tutorials and watching countless youtube videos on making tote bags, I decided to tackle The Market Tote Tutorial. 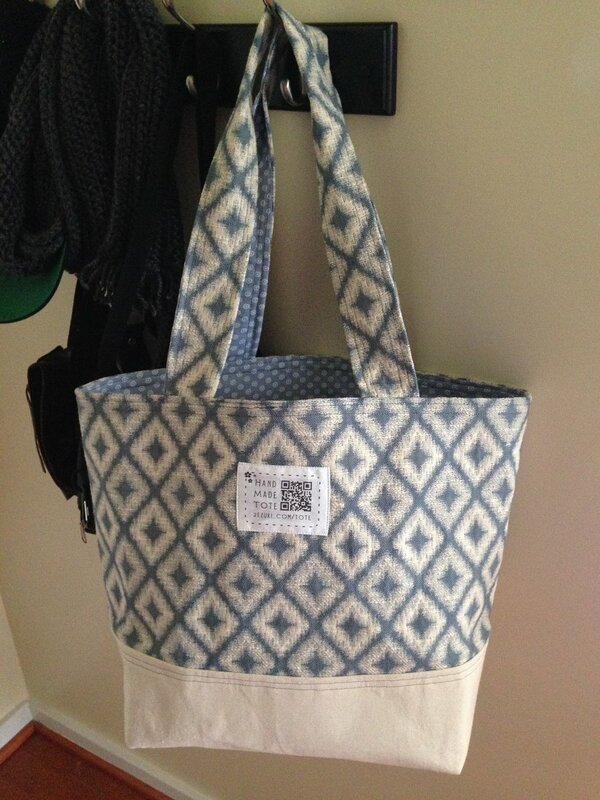 The first tote bag I made, I followed the instructions exactly as written, all 36 steps. It literally took me all night and into the morning, probably a good 8 hours to make one bag! I’m not getting rich making and selling bags nor would it be a viable business, Ms Slow Poke. 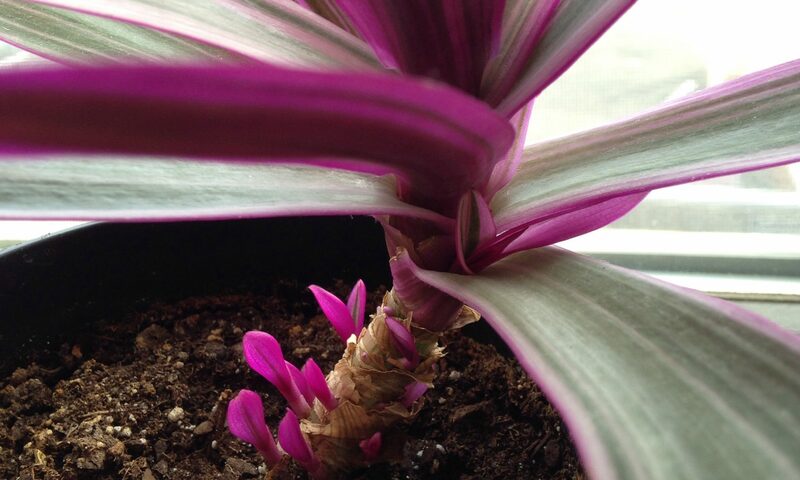 :blush: Some steps had me scratching my head while others were just trickier than it seems. 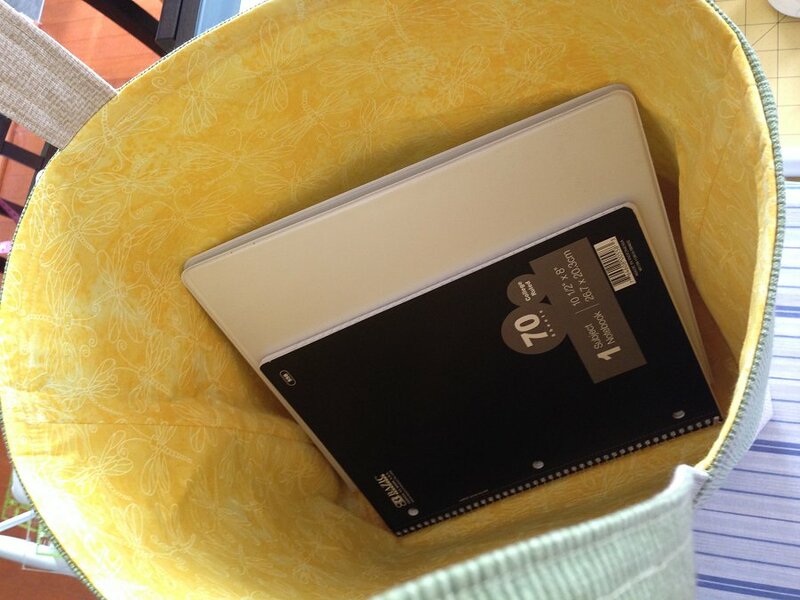 It’s a big size, can fit a binder and notebook with no problems! It stands and hangs well. It’s large!